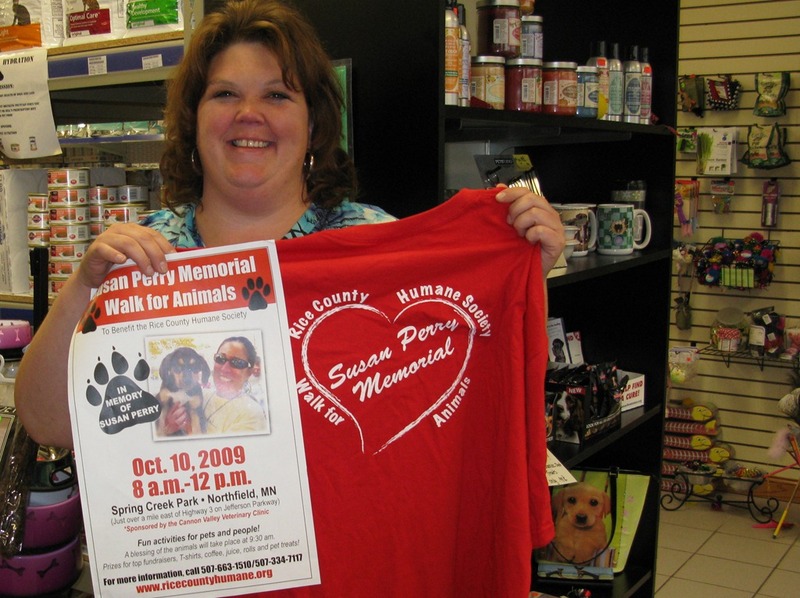 I stopped by Cannon Valley Veterinary Clinic’s retail store yesterday to get a photo of staffer Leah Erickson holding up a poster and t-shirt for next Saturday’s Susan Perry Memorial Walk for Animals (PDF poster), a benefit for the Rice County Humane Society (RCHS). The clinic is an event co-sponsor. set up your own fundraising page and then ask friends and family to donate via your page. RCHS reminds everyone that they receive "… no tax dollars or United Way funds, and rely on donations from animal lovers like you to help us help animals." Sue is greatly missed by many of us who frequent Cannon Valley Vet Clinic with our animals. Her big smile and even bigger heart greeted every person and animal that came thru the door. Sue was always there to give a hug or kind words when a beloved pet was sick or passed away, or share in your joy of a new puppy or kitten! She was a devoted supporter of the Rice County Humane Society and it’s programs. This is great way to honor her memory and her love of all animals! Sue Perry was a generous, loving person. Everyone who was ever the recipient of her friendship and caring was fortunate. Sue was planning on helping to plan a fall walk in Northfield, and we were all so excited to have a walk here. We decided that this event should be named in her memory. It is not only a fundraiser for the Humane Society but a memorial to Sue and a cause she held dear. We will have a short prayer service/memorial/blessing of the animals at 930 am. Everyone is welcome and come whether you have a dog or not. I have a dog who LOVES to walk. Plannng on a great day-hope to see you there! We held our last planning meeting last night for Saturday’s event and we have lot’s of fun things planned. There will be raffles, treat bags for both dogs and cats, face painting, balloons, great prizes, event t-shirts, nail trimming (for dogs, not humans! )coffee, hot chocolate, juice and rolls for the humans and treats for your dogs! Be sure to check out the St. Bernard cart rides! Meet our Special Celebrity Guest Scooby Doo! Don’t miss the Blessing of the Animals at 9:30 AM. We encourage everyone to come and walk one of the routes from 1/4 mile to a mile or anywhere in between or further, weather or not you have a dog, cat, rabbit, ferret, bird, etc. The event will be held rain or shine (or snow). (there is a wonderful pavillion at the park in case of rain) Dress appropriately and don’t miss out on the fun! All of this to raise money to help the homeless animals of Rice County and honor Sue Perry’s passion and love for all animals! Saturday will be a great day – rain or shine! Help us remember and honor Sue Perry in the way she should be remembered – as a tireless, loving helper to homeless animals. Join us at Spring Creek Park on Saturday and help make this an event to remember! Many, many Northfield Businesses have been very generous in donating prizes for the walk, so don’t miss out on your chance to win big. All you have to do is raise money and come and walk and celebrate. I also miss Sue and am looking forware to participating in the walk on Saturday! I know it will be a fun and meaningful event. I always enjoy the opportunity to help animals; and my family can confirm that I’m always up for fun. So, I will dress warmly and come to enjoy the fellowship of fellow animal-lovers and their animals. I have been communicating with Sue’s family in Wabasha and some of them will be there Saturday to remember her with us, so don’t miss the 930 blessing. I know Sue would not let the weather stop her-she came to Winter Walk last year for the Parade dressed in so many clothes but with her big smile leading us on. So get your winter clothes out NOW!!! My Basset Hounds, Sophie and Molly, loved Sue and are rested up for the walk and ready to help raise money for the animals at the RCHS. They don’t walk real fast or very far so they may try to hitch a ride with the St. Bernard’s cart! It’s going to be a great day and a great celebration of Sue’s love and passion for helping homeless animals! My springer spaniels, Casey and Gator, friends of the above mentioned Basset Hounds, Sophie and Molly, are looking forward to Saturday. Casey has a bum knee and does not get too far, but Gator can walk and walk and walk….he would be happy to accompany anyone. Sue took care of Gator when he had some serious surgery as a puppy and went with me when Casey had several surgeries earlier this year and last year. They loved her and were always so happy to see her, and I was always glad to have her company and advice with their medical adventures! We would like to thank the Cannon Valley Veterinary Clinic (www.cannonvalleyvet.com) for sponsoring the Susan Perry Memorial Walk for Animals to benefit the RCHS. Thank you to Dr. Werner, Dr. Strobel and your staff for allowing us to honor Sue in this way. Thank you to Leah for being a member of the Walk committee; your help has been priceless! When Sue passed away we all felt their loss and grief. It was very apparent that Sue was more than just an employee to the people at the clinic; she was a part of their family and a dear friend. The Cannon Valley Vet Clinic has some of the most caring animal people you would ever want to care for your pets. Currently having two dogs and a cat as well as various other pets over the years, I can attest to the fact that Dr. Geoffrey Passe, Dr. Rebecca Tollefson and Dr. Marcia Bisel are three of the best veterinarians around. They not only are wonderful veterinarians but are very caring individuals. I am a frequent visitor to the clinic since my Basset Hound Molly has Addison’s disease (www.addisondogs.com), my cat has Hyper Thyroid disease and with her age is now dealing with some arthritis issues. I could not ask for better care of my beloved animals from these three veterinarians. Molly was diagnosed with Addison’s when she was just over a year old and very sick. She had endured four surgeries by the time she was one year old for various ailments. Addison’s is a rare disease, which mimics other ailments and most dogs die before they are diagnosed. Thru all of this Sue was also always there with encouraging words or a hug just when it was needed most. Molly now visits the clinic every 25 days to receive a Percorten-V injection (percorten.novartis.us) to control her Addison’s; she also takes a steroid pill each day. Thanks to the wonderful care of my dog provided by these veterinarians and their ability to teach me what I need to do to manage Molly’s Addison’s disease, my beautiful “little” (she’s 78 lbs of pure love) Basset Hound, lives a happy, playful, mostly normal, dogs life with my other Basset/Lab mix Sophie and cat Lucy. My mother was lucky enough to have adopted one of Sue’s beloved pets, her cat Trevor. The folks at Cannon Valley have also been very helpful and caring to her and Trevor as well. Sue is greatly missed by many, humans and animals alike, so thank you Cannon Valley Veterinary Clinic for helping us to honor her and help the homeless animals, which she so dearly cared about. Saturday is going to be a great day! It’s a great day for a Walk! A little bit of snow and cold won’t dampen our spirits. Put on your long johns, boots and mittens and come on out for all the fun. A little snow would never have kept Sue away! Let’s honor her by having a great turn out and raise money for the homeless animals of Rice County. We’ve got hot cocoa and coffee to help warm your hearts as well! The walk is from 8:00 to noon so there is plenty of time for the sun to come out and even if it doesn’t, it’s still a GREAT DAY for a walk! Thanks for encouragement, Sandy. Alas, I’ll be in Albert Lea for a funeral. Take photos, will you? There may have been some cold noses (humans and dogs) this morning, but there were a lot of warm hearts at Spring Creek Park for the Susan Perry Memorial Walk for Animals. The weather didn’t dampen anyone’s spirit or keep people away. We had over 50 walkers and 60 plus dogs who came from Northfield, Wabasha, Kenyon, Lonsdale, Faribault, Waterville and other surrounding communities. Members of Sue’s Family, Co-workers, friends, Vet clinic clients, church members, RCHS volunteers and some who never even knew Sue came out to honor her memory and help the homeless animals of Rice County. The money raised this morning has not completely been tallied as of yet and there are still donations coming in, but we are very thankful to all who came out, walked their dogs, and shared in the celebration of Sue Perry and her love of all animals. Our fabulous volunteer photographer, Bridgette Hallcock, took many pictures of the event and we will get those sent to Griff so everyone can see what a great day it was! If anyone would like to still donate they can send a check payable to the Rice County Humane Society,1201 Cannon Circle, Faribault, MN 55021. Please designate on your check “Susan Perry Memorial Walk”. Friday night I was an insomniac from thinking about the walk, I was so excited it was here and also of course worried if we had forgotten anything. Last night I was also awake, because I was so moved by everyone who came out to honor my friend Sue and help us in our mission to care for the animals she so loved. I am so glad her family and friends were there and so thankful for Pastor Dan Clites and his awesome service. THANK YOU EVERYONE. I know our friend is smiling down today from heaven on us. Check out the pictures from the Susan Perry Memorial Walk for Animals. Griff has them posted in the Locally Grown Photo Gallery. Thanks Griff!